Choose your own theme at Jamestown Settlement: “Pretty and Curious Secrets” (Foodways); “Charge Your Pike – Defending the Colony” (Military); “Concerning Linen, Leather and Silk” (Historical Clothing); “All sortes of Herbes” (Gardens); “Art and Culture at Jamestown” (Arts); and “Tales of Yuletide” (Christmas). At the American Revolution Museum at Yorktown, choose among “School of the Soldier” (Military); “Shot Heard ’Round the World” (Historical Clothing); “The place where they delight to grow” (Gardens); and “Provisions Scarce” (Christmas). Premium theme tours are subject to availability, limited to 14 people per theme, and advance reservations are required. Premium themes can be added to private tours tours for $60 per museum; if reserved within three days, the cost is $90 per museum. For reservations, call (888) 868-7593 toll free Monday through Friday, 9 a.m. to 5 p.m.
Add “pretty and curious secrets” to your Private Tour to uncover surprising facts about 17th-century English culinary arts and how they played a role in a colonial outpost such as James Fort. Participate in a hands-on hearth or baking activity with a costumed historical interpreter in the re-created fort, and take home recipes from Gervaise Markham’s book “The English Hus-wife,” first published in London in 1615. In re-created James Fort, participate in a special pike drill led by a costumed interpreter and learn about the primary means of warfare in Europe in the early 17th century. Examine a reproduction of a very unique pikeman’s breastplate recently excavated in Virginia, and learn how the English had to adapt their weapons and gear to better suit their circumstances in the New World. Then see a matchlock musket loaded and fired. Take home a book of instructions by Jacob DeGheyn for wielding the pike. 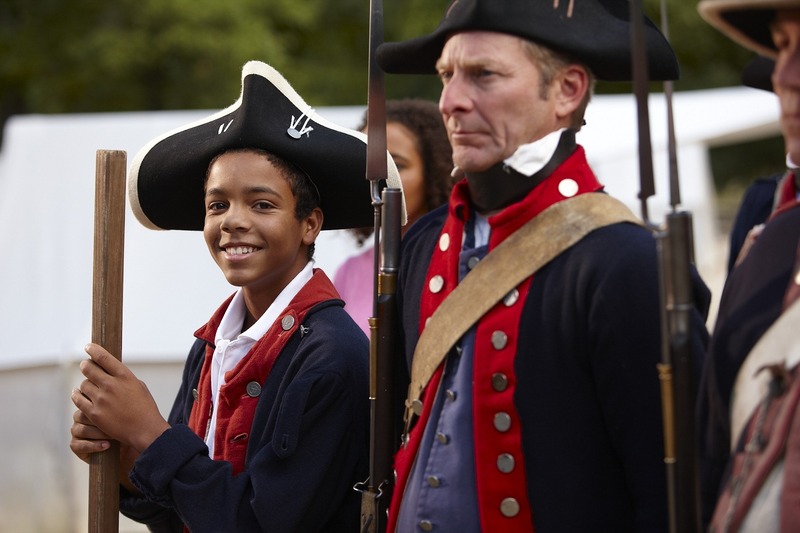 In the Continental Army encampment, experience the life of an American private in the Revolutionary War. Huddle in a private’s tent shared by six men, learn about medical care for disease and wounds, how soldiers cooked their food, and how secret messages were encoded and sent. March and drill to the commands of your sergeant – a costumed historical interpreter – and see a flintlock musket loaded and fired. Roll a blank musket cartridge to take home. In Jamestown Settlement’s exhibition galleries, explore how documents and images from the past reveal 17th-century dress and style and how fashion announced social and economic status. Outdoors, talk to a costumed interpreter about their Powhatan or English-styled clothing. Visit the historical clothing shop where attire for interpreters is produced, and talk with our clothing historian. Take home a pattern for a woman’s coif, men’s bag hat or simple embroidery project. Join a historian in a private setting to try on and compare uniform coats of the French, German and American armies, and coats worn by African Americans serving with the British army. Each coat has been carefully researched and painstakingly reproduced in several sizes for our visitors. Bring a camera and take photos of yourself and family members in the uniforms of the Revolutionary War, then make a ribbon cockade to decorate your hat. Discover how the English adapted their farming practices to the soils and climate of Virginia in the early 1600s, and how their constant need for food contributed to a war with the Powhatan Indians. In the Powhatan village garden, speak with an interpreter about farming tools and practices, and the many ways the Powhatan people used native plants. After exploring English garden beds, an interpreter will explain how herbs were used to treat medical conditions. Make and take home a packet of aromatic herbs as described in John Gerard’s “Herball,” first published in 1597. A middling farm family in 18th-century Virginia grew much of the food they ate. In the re-created farm, learn how herbs and vegetables were grown, then pickled or dried for later use. Tour the kitchen garden with a costumed interpreter, and identify familiar and unfamiliar plants grown in the 18th century. Make an authentic rosemary salve and discuss medicinal uses of common herbs of the period. Examine 17th-century arts of the Powhatan Indians, Africans and English in the Jamestown Settlement exhibition galleries. Discuss how first impressions of the Virginia Indian and west central African cultures were formed in western minds by early European images of each group. Then in the outdoor living-history areas, work with a costumed historical interpreter in the Powhatan village to learn a Powhatan art form, such as shaping a shell bead or making a basket. Discuss winter and holiday customs at the Powhatan village, 17th-century ships and Jamestown fort, and work with a costumed historical interpreter to bake a 17th-century holiday treat. Book your tour to coincide with “The Lord of Misrule” (December 23-31, 2017, reservationists will assist) and participate in 17th-century English holiday revelry. Make and take a decoration made from local greenery. Tour the Revolution-era farm to learn how the holidays were observed by most Virginians in the 18th century. In the re-created Continental Army encampment, hear tales of December victories and hardships. Compare regulation rations to the fare that was actually available during a harsh winter like that of 1777-78. With a costumed historical interpreter, make hardbread for the encampment and then take home a piece to remind you of the holidays during the Revolutionary War. Explore the museum’s African collection at Jamestown Settlement and take a behind-the-scenes tour with a curator to see objects of copper, known as “red gold,” not currently on display.